Thanks for bearing with me while I took the holidays off. I’m happy to share that my head is feeling mostly better, and I’m writing again. It feels GREAT to be back behind the keyboard. I’ll be putting the first few chapters of Nadya up on Wattpad as soon as I can mock up up a cover for them (ping me if you’re interested in helping), just as a teaser to tide you over until I can get the final thing whipped into shape. I can’t wait to hear what you think of it. In Soulwoven-related news, we’ve crossed the 100,000 reads mark! 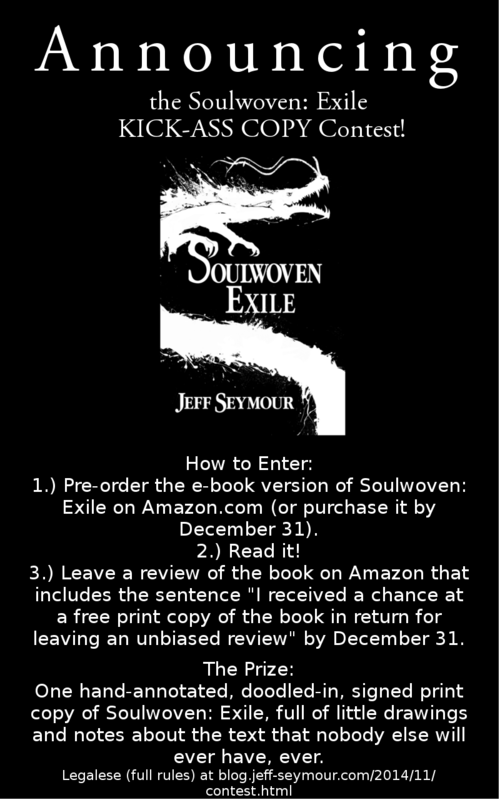 This is a big moment for me, as (in my head, anyway) it marks a boundary between “Should I publish this or not?” My relationship with Soulwoven has evolved significantly since I started writing it. It’s my first novel, and the things I’m trying to do in it (creating a complete secondary world, telling eight different sides of a complicated story in alternating points of view, and working in a pretty saturated genre) are wildly ambitious, given that. I’ve gone from seeing it as my ticket to the big-time to seeing it as a sort of off-beat, interesting, arty project that, if it finds great success, will find it through the love of a few dedicated fans and word of mouth, rather than through the enormous, heart-and-soul-powered mechanism that is the publishing industry. Thanks again for being a part of it. Three Dances is coming as soon as I can get these copy edits finished. You may also have noticed that I posted an interview with Gytha Lodge, author of The Fragile Tower. I plan to do more of these with some of Wattpad’s top-ranked authors, and they’re worth checking out. Gytha’s got a very interesting personal story involving a literary agency, a theatre award, and a stationery company. And, of course, Happy New Year! All the best to you and yours, and thank you for bringing a little bit of your light to my world in 2012.